You might not have heard, but there’s a new Star Wars movie coming out soon – and as we get closer to returning to the galaxy that’s always so far, far away, it’s only natural to take a look back at all the ones that came before it and see if they still hold up today. So, for the next few days until the release of The Force Awakens, we’ll be reviewing all six movies – yes, in order of number and not release – in the saga that helped define the blockbuster ethics we’re familiar with today. 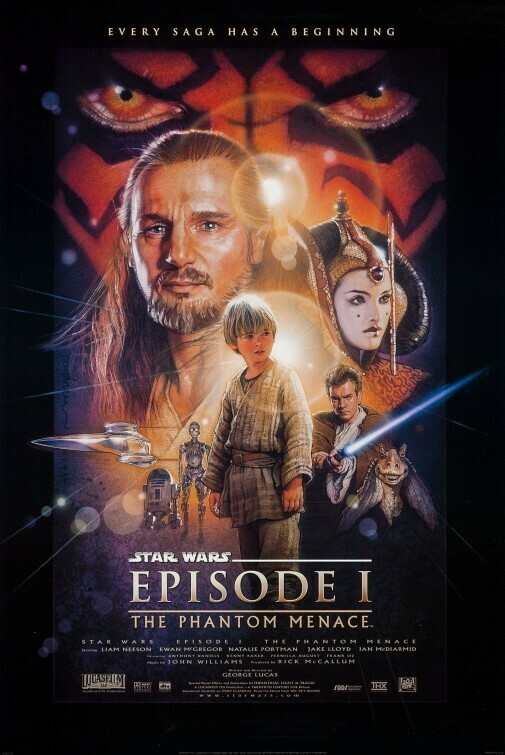 The first one we’re taking a look at, The Phantom Menace, is infamous within the geek community for all the wrong reasons – after a feverous amount of hype leading up to its release back in the summer of 1999, many fans hoping that the initial magic would be recaptured were left feeling severely disappointed, and the backlash continues even to this day. The overwhelmingly negative response from fans and audiences is beyond legendary by this point, with some even considering it to be one of the worst follow-ups ever made. Is it deserving of such hate? Well, not entirely – or at least, not from this reviewer’s perspective. Make no mistake, it’s definitely not a good movie; the flaws and weaknesses do outweigh its strengths, and upon re-watch a lot of it doesn’t especially hold up, but you have to know something; amidst the wild reactions of the Star Wars fandom at the time, there were also the kids who were curious about this big, epic space film with tons of cool-looking effects and weird alien creatures. For them, even if they didn’t think it was anything spectacular, it was such an awesome experience to watch in the cinema that it left a special place in their hearts, just as the originals did for everyone who was disappointed with this film. This reviewer was one of those children. Just imagine a six-year-old version of the person writing this right now just coming out of that auditorium feeling blown away by how awesome the film he just watched was. He loved the effects, he loved the action, he even liked – not loved – the much-reviled Jar Jar Binks character with his amusing antics and funny moments of clumsiness. At that point, he had no idea that the overall reaction from real fans was muted, and he didn’t really care; he had the most fun all summer watching that film, and would continue to think for a while after seeing it that The Phantom Menace was the best film ever made. Sixteen years later, of course, that is no longer true. Now that this wide-eyed six-year-old is an adult, old enough to make their own competent decisions, they look back on the film they loved as a child and recognise what doesn’t really make it work. They find, like everyone else had at that point, that George Lucas’ writing and direction was stilted and wooden, the political debates and trade negotiation side-plots were dull and just as lifeless as the overload of visual effects that haven’t aged well with time, the actors’ performances and deliveries were emotionless and without proper conviction – Jake Lloyd, as a young Anakin “Now THIS is pod-racing!” Skywalker, is a particularly irritating presence – and Jar Jar… well, let’s say there’s a very good reason why he’s so despised in popular culture (though we honestly felt more uncomfortable around those Asian-accented Trade Federation aliens than we were with Binks). By its standards, it’s definitely a bad movie… and yet, we can’t hate it as much as everyone else does. Perhaps it’s the young six-year-old who loved this movie speaking, but despite its flaws we can’t help but admire it. It’s by no means a good movie, and we absolutely understand why virtually the whole world eventually conspired against it, but it’s personally hard for this reviewer in particular to harbour the same grudge for it as everyone else. It’s like coming across a bunch of your favourite toys from your childhood in the attic; you know you’ve more than outgrown them, but you can’t compel yourself to throw them away or pass them on to somebody else without a second thought. 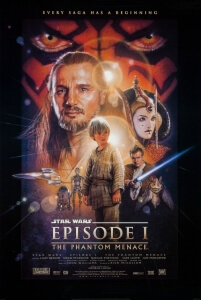 In fact, there were moments while watching this film again that brought back those powerful emotions one experienced as a kid; the central pod-race sequence, though overlong, is still exciting enough to draw attention and be concerned about what’s going to happen, the climactic lightsabre fight between Liam Neeson’s Qui-Gon Jinn, Ewan McGregor’s Obi-Wan Kenobi and Ray Park’s devil-horned Darth Maul is a stunning piece of choreography set to some of John Williams’ most powerful music of the entire series, and the sheer size and scope of the different planets we visit over the course of the film is phenomenal, even if a lot of it is CG-enhanced (a trait that Lucas himself would eventually become known for later on). Overall, while it’s definitely not technically a good movie, it’s hard to hate from our perspective; and though this is a rocky start to the anticipated Star Wars prequel trilogy, things HAD bound to become smoother from there onwards… right? The Phantom Menace is not entirely deserving of its widened hate, though we do agree that by most accounts it’s definitely not a good movie from its dated visual effects to George Lucas’ stilted writing and direction, but maybe that’s because we still have a fondness for it due to the impact it had on this reviewer as a young child all those years ago.